I know it's a little early for "Gung ho fat choi", I mean, Chinese New Year is still a few weeks away. 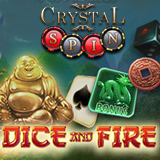 But I've just been playing the new Asian-themed Dice and Fire slot game but Crystal Spin Casino and I'm just in a kind of Oriental mood I guess! The new Dice and Fire is a 5-reel, 20-line, Asian-themed video slot with Jade Dragons and Golden Buddhas and a special double-or-nothing bonus feature to multiply winning spins. Three or more Jade Dragons can win up to 7575 bonus points. The scatter symbol is an ancient Oriental coin and three or more of them can win up to 12 free spins with 10x multiplier. A smiling Golden Buddha is Wild. After every spin with a winning combination, players are offered an opportunity to double their win by betting if the next card will be red or black or get 4x their win by getting the suit of the next card dealt correct. Or they can just take their win and return to the main game. Crystal Spin launched another new game, Sugar Rush, just a few weeks ago. Article and video. Crystal Spin Casino welcomes players from around the world with dozens of traditional casino games and unique slots games from TopGame.